Click here for information on the Holywell Music Room, purchasing tickets from resellers and where to get your complimentary cup of coffee. Born in 1992, Savitri Grier read Music at Christ Church, Oxford, graduating with First Class Honours, and went on to Guildhall School of Music & Drama to complete her Artist Diploma, studying with David Takeno. In 2015 she was selected for representation by Young Classical Artists Trust. Savitri later made her debut at Carnegie’s Weill Hall and appeared as soloist with the the Bournemouth Symphony, English Chamber, Welsh National Opera and Birmingham Sinfonia orchestras. In recent years, Savitri has given recitals and taken part in festivals and masterclasses across Europe, including IMS Prussia Cove, the East Neuk Festival Retreat, the Holland International Music Sessions, Musique à Marsac in France, the Sage Gateshead, Newbury Spring and Roman River Festivals. She also made her debut with the Royal Philharmonic Orchestra in a series of performances of the Mendelssohn Concerto, gave a return performance at the Wigmore Hall and continues to give recitals throughout the UK. Savitri’s highlights as a soloist have included performances of the Sibelius and Tchaikovsky Concertos with Oxford Philharmonic Orchestra, Mozart with the Barbican Young Orchestra and Mendelssohn with the English Festival Orchestra at the Royal Albert Hall. A committed chamber musician, she has collaborated with Susan Tomes, Christoph Richter, Steven Isserlis, Andrew Marriner and Alasdair Beatson, and regularly gives recitals with the Grier Trio (including her sister Indira and father Francis). In 2014 the Trio gave their first performance of Beethoven’s Triple Concerto, and performed Messiaen’s Quartet for the End of Time with Andrew Marriner at King’s College Chapel, Cambridge. Savitri is grateful for support from Help Musicians UK, the Philharmonia Orchestra/Martin Musical Scholarship Fund, Hattori Foundation and the Countess of Munster Musical Trust. Her awards include First Prize at the Oxford Philomusica and Tunbridge Wells International competitions. In 2015 she was selected for the Philip & Dorothy Green Award for Young Concerts Artists. She has participated in masterclasses with Ferenc Rados, Johannes Goritski, Maxim Vengerov, András Keller, Anne-Sophie Mutter and Thomas Adès, among others. Born in Osaka, Japan, Tomohiro Arita began playing the violin from an early age and first came into contact with the viola at the age of 15. To date, Tomohiro has played as a soloist with the Geidai Philharmonia, Kojima Musica Collegia and Birmingham Conservatoire String Orchestra. In addition, he studied under Nobuko Imai and members of the Berliner Philharmoniker. including Amihai Grosz, Mate Szucs and Walter Kuessner. he studied the violin under the late Togi Sachi and the late Chihiro Kudo, and is currently studying under Toshihiko Ichitsubo. After graduating from Tokyo University of the Arts in March 2017, Tomohiro studied at the Hochschule für Musik “Hanns Eisler” in Berlin. He is a member of the Deutsche Kammerphilharmonie Bremen Academy. Leander Kippenberg was born in 1991 in Frankfurt am Main, Germany into a family of artists – his mother, a violinist in the Deutsche Kammerphilharmonie Bremen while his father is a puppetier and director of his own masks and music theatre. Leander had his first cello lesson at the age of nine and at 15 he joined the class of Prof Michael Sanderling at the University of Music and Performing Arts in Frankfurt. A year later, Leander moved to Berlin to continue school at the Musik Gymnasium, Carl Phillip Emanuel Bach. During this time, he played as the principal cellist in Die Deutsche Streicherphilharmonie youth orchestra. He toured to Cyprus and Montenegro with Jeuness Musicale, recorded Schumann’s Cello Concerto in the version for cello quartet (with Benedict Klöckner as the soloist) and Souvenier de Florence as the principal cellist. In 2009, Leander moved back to Frankfurt, to study at the University of Music and Performing Arts with Michael Sanderling, where he was sponsored through Freunde Junger Musiker e.V. and won a scholarship in the Pirazzi Competition. The following year, he made his concert debut as a soloist playing Schumann’s cello concerto in Bremen with Sinfonia Concertante. In 2011, Leander embarked on a Bachelor of Music degree at the Guildhall School of Music and Drama in London with a full scholarship, to study under Prof Louise Hopkins. He went on to study for his Guildhall Artist Masters degree in 2016. Leander’s concert experiences include solo outings, recitals and chamber music concerts in Germany, France, Austria, Switzerland, Portugal and the UK in concert halls such as the Tonhalle Zürich, the Broadcasting Hall and the Glocke in Bremen, and St John Smith Square, Saffron Hall and the Barbican in London. His solo performances include Tchaikovsky’s Variations on a Rococo Theme with the Young Musicians Symphony Orchestra in London, the Saint-Saëns Cello Concerto with Die Deutsche Kammerphilharmonie Bremen, and multiple performances of Schumann’s Cello Concerto with the Kamerata Bremen. Leander has participated in several master classes and festivals, including the Harmos Festival in Portugal, the Youth Classics International Music Festival in Switzerland and the International Musicians Seminar in Prussia Cove, studying with renowned professors including Wen-Sinn Yang, Michael Sanderling, Gary Hoffmann, Louise Hopkins, Erich Höbarth, Ralph Gothoni and Thomas Adés among others. Since March 2017, Leander has been an Academist at the Die Deutsche Kammerphilharmonie Bremen with which he has performed in some of the world’s greatest concert halls, icluding the Elbphilharmonie in Hamburg, Shanghai Concerthall, Amsterdam’s Concertgebouw and many others. Yundu Wang is an American classical pianist, currently based in London. She is equally committed to solo, collaborative, and chamber music, and has performed throughout the UK and the United States, as well as in France, Belgium, Germany, Spain, Russia, Israel and the Netherlands. 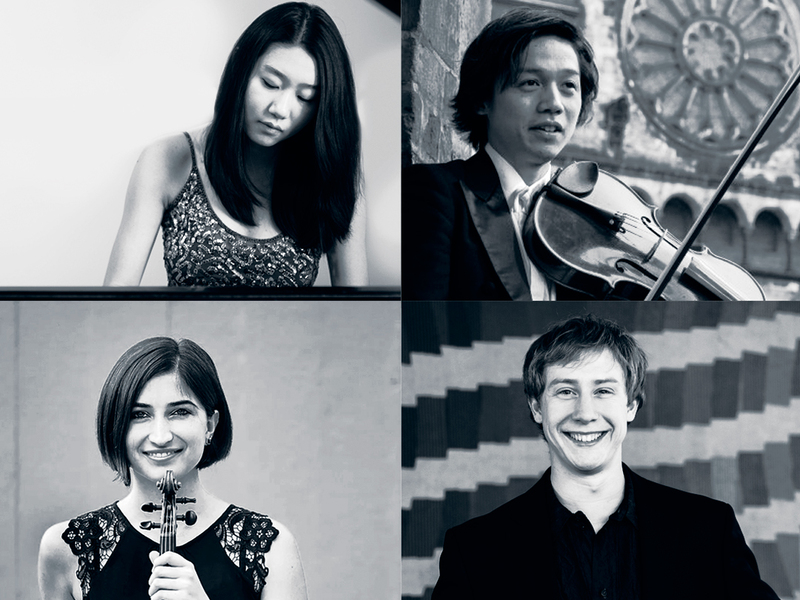 Yundu has participated in a number of festiveals, including the Yellow Barn Chamber Music Festival, the Itzhak Perlman Music Program’s Chamber Music Workshop, and the Aspen Music Festival. She is a member of the Clara Trio and won the Honors Chamber Music Competition at New England Conservatory, leading to a full concert debut in Boston’s Jordan Hall. She has worked with and performed alongside renowned musicians such as Itzhak Perlman, Paul Katz, Roger Tapping, Peter Frankl, and the Weilerstein Trio. She has also taken part in masterclass courses and festivals including the Holland Music Sessions, the International Musical Enghien Master Classes in Belgium, the Hellens Music Festival, and Jeunesses Musicales Deutschland. She has also taken part in solo masterclasses with Jonathan Biss, Richard Goode, Imogen Cooper, Jean-Bernard Pommier, Polina Leschenko and Boris Berman, among others, and has worked on chamber music with Donald Weilerstein, Vivian Weilerstein, Heime Müller, Ralf Gothóni, David Waterman, and Jonathan Brown and Abel Tomàs of Cuarteto Casals. Yundu’s prizes in solo piano competitions include the Honors Competition at New England Conservatory, the Seiler International Piano Competition in Germany, the Julia Crane International Piano Competition in New York and Gavrilin International Piano Competition in Russia. She has also been awarded the Glass Sellers’ Beethoven Prize at the Guildhall School of Music & Drama in London, where she has been a doctoral candidate. (Her research has investigated the possible influence of speech prosody on musical expression in piano performance.) Her doctoral supervisors are Ronan O’Hora, Martin Roscoe, Dr Cormac Newark, and Dr Elinor Payne of the University of Oxford. Her studies have been supported by the Guildhall School Trust.